Sometimes, the simplest movements are the hardest to master. 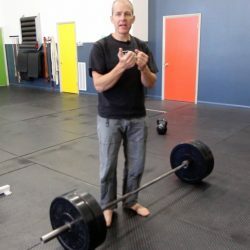 When we look at the value of particular resistance exercises, it’s hard to dispute that a very few movements can make or break a training plan. Working with just a squat, a deadlift, a push-up variant, and pull-ups, you can develop a life-long fitness plan that will serve to support your climbing for years to come…but you have to do it right. This is where pull-up progressions come in. In an effort to get what we think of as “more” out of a session, we sometimes cheat the movements to get the reps in. Add in the popular fad of timed weight training sessions, and an athlete’s execution can really go in the toilet. Unfortunately, doing tons of crappy reps translates directly to your performance. Mess it up in the gym…mess it up at the crag. In order to master the pull-up, every athlete should make sure his execution is perfect before adding any additional intensity. You might think you’re already good at pull-ups. A quick check would be to video yourself to make sure your bottom starting position is correct and that you are truly getting your whole head above the bar. The poor shoulder position (left), and the engaged shoulder (right), with the arms “pulled away from the ears”. Start with straight elbows and shoulders packed (imagine ears are red-hot and you’re trying not to burn your shoulders…) Yes, your shoulders need to be “engaged”. Despite what you might have heard, straight elbows are safe at the bottom of the pull-up. Pull through the whole range of motion with control and with a tight core. Finish with the neck or collar bones touching the bar. Legs should be held straight or slightly forward. Abs braced like you’re going to be punched. To get to the point you can do a perfect pull-up, start with the basic variations. Unless you are very weak, stay away from pull-downs on machines and those anti-gravity assisted pull-up thingies you see at Planet Fitness. These are similar in movement pattern but don’t translate well to real pull-ups. Another popular regression is to use elastic bands to help. My friend Rob Shaul told me that bands didn’t work about five years ago…it just took me about four years to listen. Better to start with the non-assisted variations as they teach you proper position, but limit range of motion. 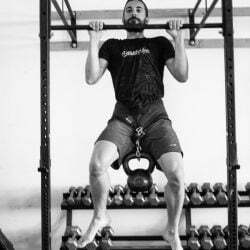 I finally put together a list of Pull-Up progressions to get our athletes from not being able to do pull-ups to being able to do them very well. Much of this progression is based on a list I got from Josh Hillis. The climbing-specific variations are beyond the scope of many athletes’ needs, yet for this audience they are a necessary progression. Pulldowns – This is a good place to start, but its effectiveness is limited. Work on palms forward and getting a full range from locked out elbows to hands at shoulder level. Don’t get addicted to these. Band Assist – This variant is of limited use as it helps you the least when you need it most. Any athlete needing more than one thick and one thin band (1 ½” total) should do partner-assist pulls instead. Partner Assist – With a partner standing behind and holding near the bottom of the ribs, do a full range movement. 3 Second Hang, top position, reverse grip – Step up to the bar on a box or chair, then slowly pick your feet up and hold for a full one second. Advance to three, then five seconds before moving to negatives. 3 Second Negative, reverse grip – From a top starting position, lower slowly and evenly through the full range of motion. ¼ Chin – From the top start position and using a reverse grip, lower ¼ of the way to the bottom, and pull yourself back up. ½ Chin – From the top start position and using a reverse grip, lower 1/2 way to the bottom (elbow to 90 deg. ), and pull yourself back up. ¾ Chin – From the top start position and using a reverse grip, lower 3/4 of the way to the bottom, and pull yourself back up. Chin – Full range of motion. Starting at bottom position and using a reverse grip, chin until neck touches the bar , then lower back down under control until elbows are locked. Pull-Up – With a hands-forward grip, pull through a full range of motion, elbows straight to neck touching the bar. Tactical Pull-Up – Set up as for the normal pull-up, but with thumbs on the same side of the bar as fingers. Pull to the top position (neck to bar), pause 1 second, then lower to the bottom. Pause 1 second, then repeat. Weighted Pull-Ups – Use a tight-fitting belt (not a dip belt – a harness waistbelt is best) and be a total stickler for ROM. Progressions beyond 5 reps are not necessary. Pull-Up, one hand on towel – Use a hand towel (gym rag). Place one hand over the bar, the other will hold on to a towel that has been folded over the bar. Follow the same range of motion rules as a normal pull-up. Start with the “strong hand” on the bar for specified reps, rest briefly (10-15 sec), then repeat with the “stronger hand”. To really progress your pull strength, you need to focus on two things: perfect form and high volume. Work on avoiding failure, rather stop at about half the reps of which you think you’re capable. This way you can get twice as many fresh reps per session or per day. Both the “Grease the Groove” tactic, and Ladders will be effective. Grease the Groove will consist of doing several sets of 2-4 reps throughout the day or workout, separated by ten or more minutes. Ladders effectively manage fatigue by keeping the reps very low on most of the sets. If you can do five reps of a particular variation of the pull-up, you could effectively train ladders of 1,2,3 reps repeatedly in a session. Instead of eeking out 3 sets of 5 (15 reps), you might do 3 ladders of 1,2,3 for 18 reps, seeing higher levels of strength for each pull.Pull-ups are but one of the staple exercises a climber needs to master, but without the fundamental strength they provide, he’s not going to get far.